Today, these Apps cover a wide range of consumer needs, such as ordering flowers, gifts, home maintenance, laundry – the list is endless. If you have products or services in the consumer sector, you should definitely consider creating an on-demand App. This App can become an important aspect of your business strategy and channel for acquiring, servicing and retaining customers. The user should be able to find what they are looking for easily, and book with as few clicks. As on-demand App tend to be used when the user is very busy with something. For example, he may be out in the rain, looking for a cab for a business meeting. So the easier it is to book, the happier he will be. Offer as many payment options as possible – credit cards, netbanking, eWallets etc. As on-demand services need to be delivered anytime and anywhere, it is essential to know the location at which the delivery is required, using geo-location technology. The consumer functionality is only one side of your business. You will also need systems, technology, and maybe other Apps, to ensure fulfillment, that is, the delivery of the goods or services at the time and place required. You may need to tie-up with external agencies, such as couriers, for this aspect. Keep the engagement with your users with push notifications from time to time. You can inform them about new launches or special offers through this channel. Consider the usage patterns of your target consumer carefully when you design the functionality of the App. How can you make it easy for her to find what she is looking for? How will you deliver it when and where she needs it? How can you make your App more convenient than what she is already using? As you are primarily a consumer marketing company, it will make sense for you to find an on-demand App development partner, while you focus on your core business. 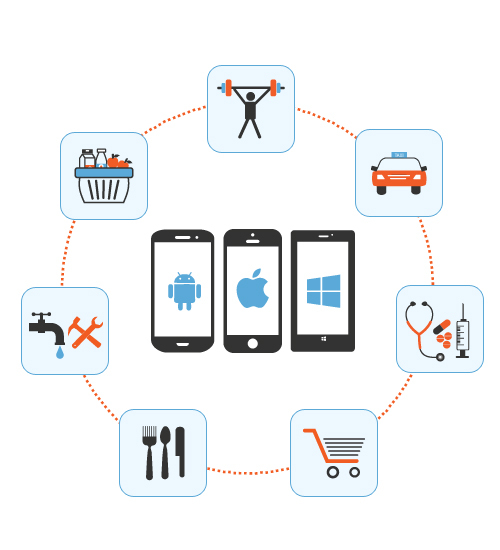 Find a web and mobile application development partner who has technical expertise in the popular mobile platforms such as android and iOS. This mobile application development company should have experience with creating such on-demand service Apps. Your on-demand App development project is handled by experts who have developed a number of products end-to-end, so there is a well-defined process that is followed and success and speed of the development is assured. Our team includes experts in all the different areas required, such as coding, QA and UX, so the coordination is smoother and faster. Each business is different, and so what are the users’ tastes and expectations, we understand that with on-demand Apps, there is a need to customize the functionality and approach to a great extent, and we will put in that special effort. The speed and performance of the App needs to be maintained across a wide variety of devices. You may need to make frequent changes to functionality, but the performance has to be optimum at all times. Smartsourcing Global is having experience in creating a wide variety of web and mobile Apps, and testing and ensuring high performance will contribute to the success of your App in a major way. Open the App to a few people and study the analytics. Speak to users and ask them how they like it. Your App will need to go through iterative changes before it delights users. The development is only half the story, you will need to drive adoption by popularizing and marketing your App with the right marketing strategy. You can create a marketing campaign for it, using digital advertising, social media and other channels. You can also promote your App on your existing channels such as your website. App Store Optimization is a systematic approach to improve your App store ranking and key to marketing an App successfully and should be adopted in a systematic manner. As adoption grows, keep looking at the App analytics. Study which features are working best and which are not. An App has to be improved and updated continuously to keep users engaged and happy. An App that performs well will generate growth in user numbers and revenues. One that does not work well will be uninstalled by users, and your investment in development and marketing will be lost. How can you estimate the budget for developing such an on-demand App? Your on-demand App development services company can help you to estimate the budget for development correctly at the start of the project. Your investment will depend on the design and functionality of the App. It will also vary depending on how many modules are required, for example – different modules for the user, the admin, possibly one for partner vendors, and so on. You will need to budget for QA as well, and of course, for marketing once the App is ready. With a systematic approach towards design, development and marketing, your on-demand App can help you to find new ways to reach and retain customers, and generate revenues.